Check you out, Mindy Kaling! We're head over heels in love with your style statement, lady, especially as it's supporting one of our hometown girls. 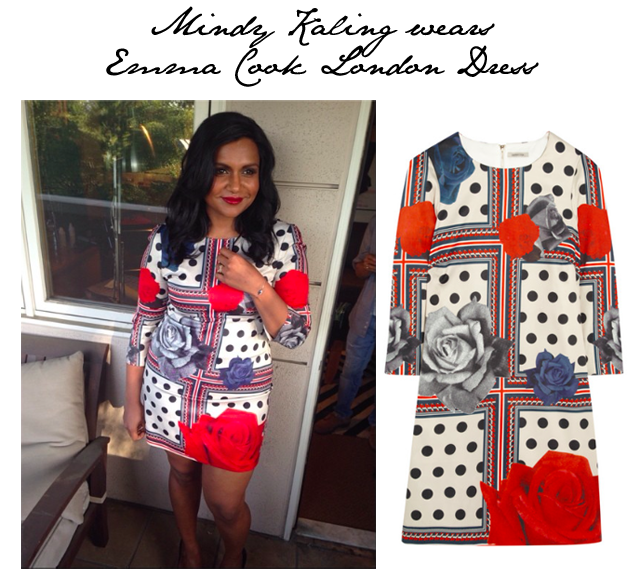 Mindy Kaling shared the above picture on instagram yesterday, proudly showcasing her Emma Cook London dress (still available to purchase). She writes, "Headed to the Deadline Awardsline screening and panel in @emmacooklondon, YSL shoes, sick @suzannekalan earrings and @litojewelry bracelet and ring. Sweet @jessicalmetivier did my makeup and Martin Samuel did my hair, which is mega." Sadly we can't see the shoes or the earrings, but we love the dress, the hair and just generally the whole vibe of the ensemble. Mindy Kaling... we heart you and your fabulous style.